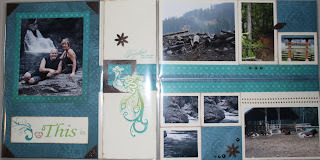 Here are the pages I created that contain 26 photos! On the left, page one. On the right, page 2. When you open the flip flaps on page 1, voila - you have another complete layout (above). Here on the right is page 2 with both of the flip flaps open (they open on the top and bottom, whereas page one's flip flaps open like a book). As you can see, another complete layout! Love it. For complete instructions on using Flip Flaps, purchase our new book called MAGIC or call me to book a workshop! These photos look great with the Magnifique paper!